Very nice looking hexacopter that is fun to fly, fast and acrobatic. MJX has been producing quality remote control products for many years. It is a legitimate company, with amazing processes of production and incredible quality control and the company began releasing the X-series models just a few years ago. The manufacturer did an amazing job of equipping the X600 with amazing artwork and high quality material. The MJX X600 is definitely the most affordable, long control distance hexacopter with headless mode. This fantastic little multi-rotor is perfect for newbies and great for drone enthusiasts. It is a very entertaining toy hexacopter that to take out to the public garden or the yard and ‘wow’ your friends. The X600 is toy grade and don’t expect to use it for videography but it flies absolutely great and has the option to FPV and record video. The MJX X600 is the biggest of a series of three hexacopters recently released by MJX. This drone is finished to a much higher grade then most other drones in its class and the first thing you’ll notice is definitely how high quality the actually craft feels.
. They surround the propellers and prevent the spinning rotors from colliding with people or objects. The X600 is above average in size and has a wingspan of 573mm. It is slightly below average in weight, weighing in at 193 grams. The X600 is a very badass looking drone, especially if you’ve ordered the matte black version. It is also available in white. The drone is also equipped with amazing LED lights. Thanks to its LED light, the X600 can be used both at night and during the day. With these lights, the drone lights up like a UFO, and looks amazing, particularly at night! Some users have reported that they had a hard time figuring out which way is the front in day flight so they used another set of different colored spare props to better figure out orientation. It is important to note that the spares for X600 are readily available online for very reasonable prices! comes with a nice 7.4V 700mAh Li-Po battery. The battery needs about 120 minutes to charge completely and a full charge will get you about 10 minutes of flight time. However, the flight time will decrease if you add additional weight. The battery voltage is 7.4V and it does an amazing job if you want to get faster responses from controls and fly faster. The x600 features a full size and full feature remote controller unlike most drones in this class that use tiny little mini controllers. The MJX X600 comes with the 2.4GHz controller that is surprisingly well built for the price. The transmitter also adapts to your favorite piloting style and it actually has a very close resemblance to the more professional hobby grade ones around. This feature allows you to switch the stick functions from pitch and roll from the right stick to the left one or back. The controller has a lot of settings you can tweak as you get more confident. There are trim buttons for every direction and there’s also a button for each stick that controls. There’s even a button to regulate how sensitive the controls are to your finger movements. The MJX X600 does not come with a built-in camera. But you are wrong if you think that it does not support a camera. This drone is compatible with external cameras that can easily attach to the drone’s body via a compatible stabilization gimbal. The drone comes with a loadable FPV (First Person View) module that can be purchased separately (includes: C4006 camera; FPV bracket). The C4006 camera is specially made for this drone and it records in 720p with nice quality for an FPV camera. It can also connect to an application available for both Android and iOS devices. This enables pilots to watch the real time video transmission on its Smartphone placed on the transmitter. It is important to note that the camera doesn’t drag the drone down too much because it is very thin and weighs only 10 grams. The camera has a very good price for what it can do and, depending on what model you pick, it can record in 720p HD or VGA quality. To fly it, you must first install the app and connect the camera to the drone. The package contains a phone holder, which can be mounted on the controller. It is important to note that this is an optional extra. If you just want to have some fun with family and friends and you are not into FPV flight, the X600 is perfect for you. The MJX X600 is a hexacopter and boasts six independent motors and has some very unique and enjoyable flight features. The six motors provide the greater level of performance, stability, redundancy and power and make for a stable flight. The MJX X600 features headless mode and one key return to home. These are two of the most current top modes on low-cost drones. Headless mode makes it easier for newbies and it is meant to facilitate pilot’s drone orientation. With one key return to home your drone will come back to the point where began flight. The drone also comes with 3 difficulty settings that control the speed and manoeuvrability. Beginner pilots should start in beginner mode and progress from there. The intermediate mode is great if you want to perform flips. You need to press the top right button each time you want to flip. The expert mode burns through the battery like crazy and it is very difficult mode to fly in. This mode does not change the speed of the drone. However, it does something really unique as every turn you make will result in a flip. The drone is also good for performing air tricks, such as a 360º but just make sure the drone is flying 3 meters above the ground before you do it. The MJX X600 is also equipped with a 6 Axis gyro that ensures stable flight and high speed action. Despite its size, this drone flies rock solid. The wind is the only thing to watch out for because if the wind is above a breeze you’ll be fighting through it with X600. MJX X600 Mini HexaCopter Drone Review - [Setup, Flight Test, Mods, Pros & Cons] 7.4V Power! The MJX X600 is small and affordable and it is perfect for newbies, especially as a training tool. This is very impressive drone. It has the high quality packaging, the advanced flight features and construction materials. 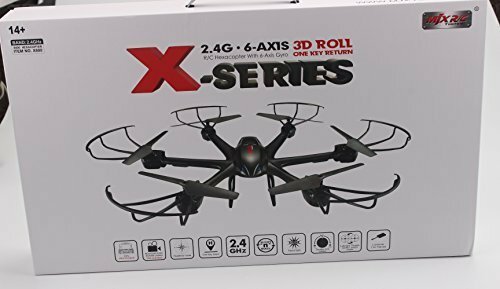 This drone is definitely the way to go if you are looking for a starter drone to dip your toe into flying. The X600 is perfect for those people who are in the market for a new drone, and want the best possible value for their money.